American Lock heavy-duty, hardened steel hasps resist cutting and sawing and are available as straight bar or angle bar styles as well as single- or double-hinged hasps for mounting to an internal or external corner or angle. These hasps are a superior choice for commercial and industrial use on warehouses, utility rooms, storage buildings, van doors and vending machines. The hardened steel staple on these heavy duty hasps resists cutting, sawing and hammering. Plus, they’re zinc plated for added strength and weather resistance. Mounting hardware is included for easy installation. Models A850, A875, and A885 are ideal for corners and angles. Includes A535, A825, A850, A875 and A885, with product specifications listed below. 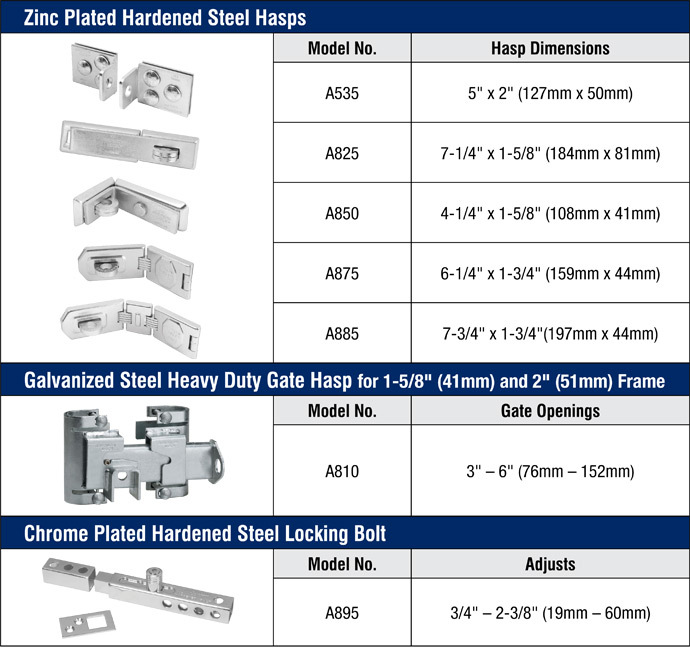 This patent-pending gate hasp provides maximum security for double-drive industrial gates with 1-5/8" or 2" frames. It accepts padlocks with 7/16" diameter shackle and 1" vertical shackle clearance; use it with the A700, A5260 or A5200 padlocks. It protects padlocks from cutting and requires simple four-bolt installation, with all mounting hardware included. An adjustable slide fits gate openings from 3" to 6" wide. This maximum strength hardened steel locking bolt measures 3/4" and is chrome plated for corrosion resistance. Mounting hardware is included. It is fully adjustable from 3/4" to 2-3/8" and accepts padlocks with a 7/16" diameter shackle.